My good friend Peter Schorsch has a great piece in stpetersblog. When will Rick Baker take the shot? If you live anywhere in CD 3, this is a must-read Post. Peter is pretty well convinced that the former St. Pete Mayor will eventually throw his hat in the ring for the CD 13 seat vacated by David Jolly. I am not so sure he will. In full disclosure, I worked for Rick Baker for the eight years of his run as St. Pete Mayor, and I have to tell you it was the best eight years of the 28, I worked for the City. The hours were long the tasks often daunting the demands unrelenting but every morning I could not wait to get to the office and do my part to help get the Baker Plan in place. Baker recently told me now that his kids were well along he was "ready to get back into public service" He went on lament about the condition of the Republican Party, the current front runner then sighed and said, "I guess I have a decision to make pretty soon." That was a month or so ago. I have always thought Baker is a fishes and pond's kind of guy. Someone who would probably rather be a big fish in a bit smaller pond than a small fish in a really big and smelly pond. Add to that Baker likes to get things done. He likes tangible results he has a very strong impatience level, and he doesn't like people and the Party telling him what to do. And he really does not like being told something cannot be done. Peter makes the point that Baker would, probably like to make another run for St. Pete's mayor, but thinks Kriseman may be unbeatable. I am not so sure. Kriseman is working hard to shore up support in the all-important south side of St. Pete, but the rest of the City may be slipping through his grasp. His low powered very expensive Mayor's office makes a lot of noise but doesn't have a lot to show for the cost. As far as the south side, plans and programs are one thing but results are another and even though the Kriseman propaganda machine is in overdrive things are only going so so. Then there is the Pier. By the time Kriseman is through with his first term my bet is St. Pete will be ready for a change. Some of the folks the Kriseman administration are pushing aside, like current and future retirees, and unfulfilled campaign promises about the west side of town are starting to bubble along with an over-emphasis on craft beer and millennials. The St. Pete renaissance continues to be confined to downtown, as a large part of the City goes wanting. In St. Pete, Baker can again work his magic and really serve the community he loves, in Congress, he just another fish in a big and messy pond. 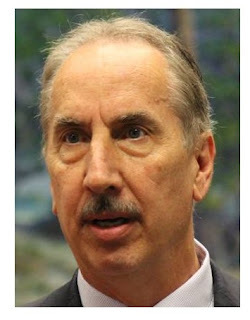 More importantly, St. Pete is really going to need Rick Baker. Congress and CD 13 will be just fine with Charlie.